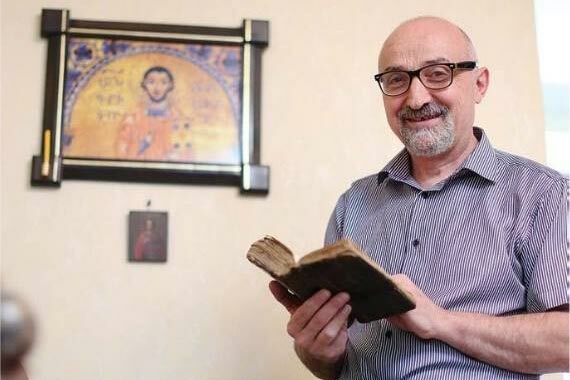 It may be inexplicable after all, but Dr. Armen Nersisyan says reading a book written by a medieval Armenian monk has proved to have a healing effect on body and mind. The Book of Lamentations, a long mystical poem in 95 sections written by Saint Gregory of the Monastery of Narek (951-1003 AD), is familiar to virtually all Armenians, yet few can say they fully understand this piece of literature that uses Old Armenian, Grabar. Giving up his professional scope of activity, Dr. Nersisyan, a professor of psychiatry, spent the past 20 years of his life researching and promoting the so-called Narek therapy, which uses the book (often referred to as simply Narek in honor of the author) for medical purposes. Dr. Nersisyan claims that the effectiveness of Narek treatment is based on the patient’s faith in the power of word and prayer. “It cures only those who believe in the biblical efficacy. Narek placates people’s souls, gives relief to their emotions and feelings, as well as has a soporific effect. While hearing Narek, the patient feels calmness and relief, which can be temporarily disturbed by tension or anxiety. Unconscious thoughts and emotions may arise causing physical and spiritual anxiety. Finally, all this leads to repentance, contributing to the relief of physical and spiritual pain,” Dr. Nersisyan says. According to the specialist, in some ways Narek therapy is much more effective than psychoanalysis, which is a longer and very often ineffective method. “People sometimes mistake Narek for hypnotherapy, actually they are completely different things. Dr. Nersisyan gives a list of many diseases which can be fully or at least partially treated using the method, depending on the patients’ attitude. Among them, he says, are schizophrenia, Hepatitis C, periodic disease, stress symptoms and depression. There are numerous testimonies given by patients, that’s why Dr. Nersisyan says he is going to write a book which will consist of his patients’ testimonies that he says once again prove the wizard power of Narek. Remarkably, last month Pope Francis declared St. Gregory of Narek a doctor of the Universal Church. Also in February Narek’s name was included in Rome’s martirology (the list of popular saints) as a monk and teacher. According to the representative of the Catholic Church, Fr. Petros Vardabyan, Narek’s prayers aren’t the only ones in their kind. The church breviary also contains other prayers that have a healing effect. Fr. Petros says, however, that Narek should not be turned into a fetish. “Only God and faith in God can cure people and not the book or a person,” he says.